A recent Scientific American post discusses a study that may indicate an emergence of “behavioral resistance” to insecticide-treated nets. Mosquitoes in Benin were found to shift their “mean catching time” (roughly speaking, the time of day when they were most likely to be active) from 2-3am to 5am; this may indicate changing behavior to attack humans closer to the daytime (when they’re more likely to be away from their insecticide-treated nets) as opposed to the middle of the night. Along with a study released last year showing increased insecticide resistance following a net distribution campaign, this study highlights a major concern for supporters of insecticide-treated nets (ITNs): ITNs may become less effective as mosquitoes adapt to them – whether by evolving resistance to insecticide or changing their behavior. We are concerned about this issue, seeking to learn more about it, and even considering recommending funding research on it. That said, we think the balance of considerations still points to ITN distribution as an outstanding intervention. Below, we lay out what we know regarding key questions around ITN resistance (defined broadly as “any ways in which populations of mosquitoes adapt to the presence of ITNs in order to make them less effective”). We then give some general considerations in favor of not weighing this factor too heavily against ITN distribution for the time being. What can aid groups do in order to manage resistance? Various techniques for mixing/rotating different insecticides may be used to manage resistance in areas where it is problematic; unfortunately, however, there is currently only one class of insecticide that can be used on ITNs. So in areas where resistance is confirmed to be an issue, other control methods can be brought in, but in areas where little is known and only ITNs are used, mixing/rotating insecticides is not an option.Despite this, the World Health Organization recommends the continued use of ITNs even in places where resistance is confirmed; they have several ways of being effective and are expected to retain partial or full effectiveness. We see resistance as a major concern; a reason that it’s important to continue collecting data on the real-world impact of LLINs (as Against Malaria Foundation is attempting to do); and an area of research that may represent a good giving opportunity itself. That said, our positive view on LLINs remains in place. There is strong evidence that LLINs reduce malaria and save lives and only preliminary/suggestive/mixed evidence that insecticide resistance may reduce their impact. In addition, it appears to us that the malaria control community has been devoting at least some attention and investigation to this issue for a long time, has developed a reasonable knowledge base (if one that has plenty of room to grow), and still recommends the use of LLINs regardless of the resistance situation. Indeed, the fact that we’re discussing this issue at all speaks to the extraordinarily and unusually strong evidence base (and supply of data) behind ITN distribution. For most aid interventions that donors can fund, the set of “things that could go wrong” is large and broad, and we have little evidence to address most of them, but when looking at LLIN distribution, the salient concerns are few and specific enough that the malaria control community is able to put substantial resources into specifically investigating them. This post does not give citations, but the technical version of this writeup does. Against Malaria Foundation, our #1 charity, has made a post of its own on this topic. Throughout this writeup, we primarily rely on two review papers (World Health Organization and Ranson 2011) whose claims we have not vetted (by, for example, examining the studies they cite); for the most part the claims cited here are fairly straightforward and we have relatively little cause for skepticism about them. What is known about the current state of resistance?“Resistance” can be used to refer to genetic properties of mosquitoes, to refer to behavioral properties of mosquitoes, or to refer directly to failures of mosquito control. In the context of malaria control, we’ve generally seen it used to refer to the first two; as discussed below, there is relatively little evidence of control failure due to these factors, so “resistance” is usually used to discuss specific risk factors for control failure. Ranson (2011) provides a map summarizing the available information about resistance, using publications from 2000-2010. In this context, “resistance” is defined by the percentage of mosquitoes that die after a set period of exposure to insecticide under laboratory conditions; anything under 80% is considered “resistant” and anything under 97% is considered “possibly resistant.” This measure is intended for sensitive, early detection and does not necessarily indicate ineffectiveness of control measures. Resistance appears common (though far from universal) in the area of western African running from Cote d’Ivoire through Cameroon; it is less common in the countries west of that and in southeast Africa; data from other parts of Africa is thin or nonexistent. Another map in the same document lists what is known about the spread of genes known to be associated with resistance; detecting genes is believed to be an even more sensitive and earlier way to detect threats of resistance. If these genes were fully responsible for the observed resistance in laboratories, that would be good news, since resistance associated with these genes appears to us to have been most heavily studied and (as discussed below) appears to be associated with relatively lower risks of control failure. However, not all of the resistance observed in the map above can be attributed to these genes, and metabolic resistance (a different type) has been implicated in 10 studies in 8 countries. The above covers only target-site and metabolic resistance, which make insecticides less effective in killing mosquitoes; by the nature of the laboratory test, it does not address behavioral resistance (mosquitoes’ changing behavior in order to avoid nets). There is currently relatively little evidence regarding behavioral resistance and no clear consensus about its importance. (Though we would encourage readers to take recent reports of possible behavioral resistance with a grain of salt. Mosquitoes’ altering their behavior could reflect many things and doesn’t necessarily imply adaptations to nets; behavior adaptations such as seeking to feed during the daytime may make mosquitoes easier to detect and thus more vulnerable; and most importantly, we would always caution against putting too much weight on a single study, particularly a recent one). the primary source of this selection pressure [for resistant mosquitoes] is still unclear although evidence is accumulating to incriminate the agricultural use of insecticides in selection for insecticide resistance in malaria vectors. 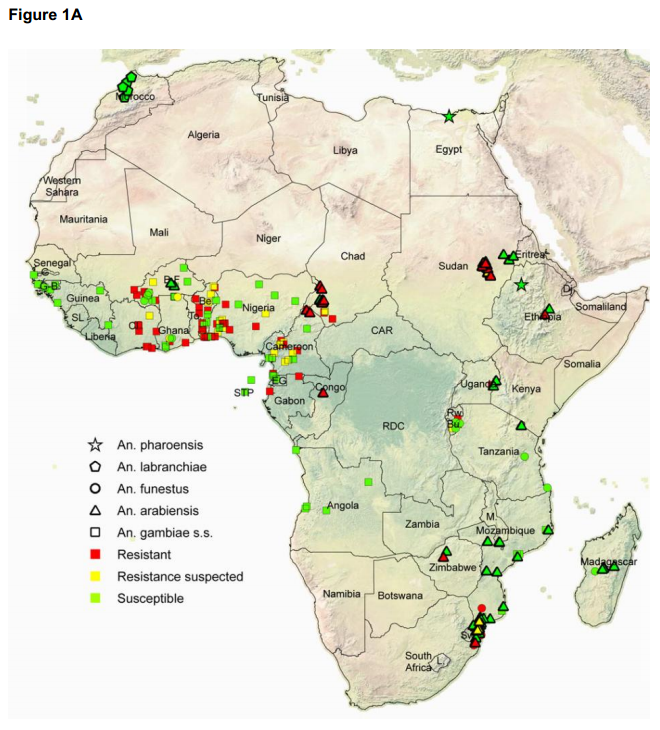 For example, seasonal fluctuations in results from WHO bioassays in major agricultural regions of Sudan and Cameroon reflect the timing of application of insecticides to the key crops in the region [45, 54]. In addition several reports have documented a higher incidence of insecticide resistance in areas of intensive agriculture than found in comparable non-agricultural sites [58, 59, 128]. There are also examples where use of pyrethroids for malaria control appears to be the primary factor in selecting for resistance [62, 129, 130]. Other sources of selection pressure including the use of consumer products such as coils or aerosols, or selection due to other toxins permeating mosquito breeding sites may also be contributing to the resistance phenotype [25, 131]. There is relatively little data available to assess this issue. It isn’t standard to collect data on malaria cases as part of an ITN distribution, and it seems that cases in which one can pinpoint the timing of both an ITN distribution and subsequent trends in malaria cases are relatively rare. We’ll be writing more about this general issue in the future; our impression is that what data there is implies that malaria has been in decline and (less strongly) that ITNs have been effective, in general, but the case is far from comprehensive. There aren’t many cases in which a study found a failure of malaria control as a result of resistance. The clearest-cut case, according to both of the sources we’ve relied on most for this discussion, was around 2000 on the border between South Africa and Mozambique. Ranson 2011 cites another, less clear-cut, case from the island of Bioko on the West African coast, and both sources cite additional cause for concern from studies using experimental huts (though Ranson 2011 notes that the evidence from these studies is mixed). There are multiple studies implying that ITNs can still be impactful even in areas where resistance is confirmed. However, these studies may be of limited use since they are focused only on a particular kind of resistance. The reviews we’ve focused on express the belief that resistance is likely to become a problem eventually and that addressing it should be considered an urgent priority. Our impression is that resistance was also a factor in earlier malaria control efforts, but may not have been as rigorously studied; the sources we’ve reviewed do not refer to these earlier efforts. There are multiple reasons that ITNs may retain effectiveness even against mosquitoes that are “resistant” (in the sense of demonstrating low mortality rates in laboratory settings). In addition to the fact that ITNs provide a physical barrier, the insecticide may also repel mosquitoes (and cause them to seek out other targets) even when it does not kill or fully disable them. In addition, it’s possible that mosquitoes are still killed by the insecticide (despite reduced susceptibility) when they have enough contact with it; that insecticide may inhibit them in other ways that stops them from transmitting malaria; that resistant mosquitoes are less fit overall or less prone to transmitting malaria; or that mosquitoes that are resistant to insecticides at young ages may become less resistant as they age (and that older mosquitoes are more relevant to malaria transmission.) We have come across one study that argues for the last of these phenomena. What can aid actors do about this issue?One approach to managing resistance is to periodically change the type of insecticide being used, so as to reduce selective pressure for resistance to particular insecticides. (This may reverse the spread of resistance, if resistant mosquitoes are less fit in other ways.) However, there is only one class of insecticide (pyrethroids) approved for use on LLINs, so in areas where LLINs are the main form of malaria control, options are relatively limited (though in cases where resistance is confirmed to be having a major effect, other methods may be brought in specifically in order to get the benefits of using multiple insecticides). The World Health Organization recommends that in all circumstances – even where resistance is confirmed and is interfering with control efforts – LLINs should continue to be promoted. Hopefully, there will be LLINs with different insecticides that are usable in the future; research has been done toward this goal and has made preliminary progress. Closing notesWe’re very concerned about insecticide resistance. It appears that relatively little is known about the extent, causes, and control implications of resistance; that resistance could substantially effect (or even negate) the effectiveness of malaria control; and that more research has great potential to improve the impact of the substantial amounts of money spent on LLIN distribution (and other forms of mosquito control). This investigation has highlighted research on insecticide resistance as a potentially outstanding giving opportunity itself, and we hope to look into it more. That said, this issue doesn’t change our bottom line that LLIN distribution is a highly cost-effective intervention or that Against Malaria Foundation is our #1-rated charity. There is strong evidence that LLINs reduce malaria and save lives and only preliminary/ suggestive/ mixed evidence that insecticide resistance may reduce their impact. Importantly, it appears to us that the malaria control community has been devoting at least some attention and investigation to this issue for a long time, has developed a reasonable knowledge base (if one that has plenty of room to grow), and still recommends the use of LLINs regardless of the resistance situation (as noted in the previous section). We have previously been impressed with the thoughtfulness and data behind malaria scholars’ answers to our concerns over the question of why universal coverage is now being pursued (as opposed to targeting children under five), the question of whether ITNs delay the development of immunity and thus merely delay malaria deaths, and the question of whether ITNs are used by recipients (though we’ve had more trouble when it comes to information about how long ITNs remain in use in the field), and we are inclined to put reasonably high weight on recommendations such as this. We see it as very important to monitor and report changes in the malaria burden following ITN distributions, as Against Malaria Foundation is attempting to do. This isn’t a substitute for studying resistance specifically, which may help the malaria control community anticipate problems before they arise. But it seems important as a way to know when resistance – or something else – has become a big enough problem to interfere with the effectiveness of ITNs in the field. We think the fact that we’re discussing this issue at all speaks to the extraordinarily and unusually strong evidence base (and supply of data) behind ITN distribution. For most aid interventions that donors can fund – water infrastructure, agriculture interventions, etc. – the set of “things that could go wrong” is large and broad, and we have little evidence to address most of them. By contrast, when looking at LLIN distribution, we see strong basic evidence for impact and reasonably good (if not conclusive) answers to the most obvious concerns about how real-world effectiveness compares to the efficacy seen in studies. The remaining concerns are few and specific enough that the malaria control community is able to put substantial resources into specifically investigating them. Paul Ewald’s work on the evolutionary biology of virulence has some very clear predictions about this case which give a hopeful prediction about what might seem to be quite a scary and terrible thing–malaria and mosquitoes evading our attempts at controlling them. Ewald’s work predicts that the malaria transmitted by more mobile people who are not sick in bed is likely to be much less harmful to the infected person than malaria transmitted by someone who is sick in bed. In short, if we think of the strategies which maximize the reproductive success (fitness) of a parasite, we realize that this is contingent upon on the host. If a parasite quickly kills its host before it gets a chance to transmit, then this parasite is not very fit. Imagine a cold which rapidly killed the host. This cold virus would have a low fitness because aside from perhaps a care-giver or two, it would not be able to transmit to many people. On the other hand, a cold virus which causes illness, but where the person is still mobile and shaking hands and sneezing on people is likely to have a much higher fitness. In a similar way, strains of malaria which make the host sicker are less likely to be spread by the mosquitoes with the new behavior and time of feeding. The strains of malaria transmitted by these mosquitoes are likely to be less virulent and harmful to the host. So while stamping out all malaria would be great, stamping out more virulent forms with bed nets is still probably a very good idea based on Ewald’s prominent theory. This ‘resistance’ to bed nets is likely to create a less harmful and dangerous form of malaria. If more specific information or references might be helpful to pursue this, let me know. Thanks as always to Givewell for a cogent summary of the issue at hand. One thing whiich I found surprising is that bednets are treated with insecticide but not insect repellant. Is there a reason why this is the case? I would think that an insect repellant such as DEET might be less likely to generate resistance, since the selective pressure of death is obviously much stronger than the selective pressure of losing a particular food source. Perhaps repelled mosquitos could continue to feed on other mammals while leaving humans alone, thus retaining their fitness in comparison to insecticide-resistant mosquitos. Ian – sorry for the slow reply on this. We haven’t thoroughly investigated this question, but I believe that insecticide-treated bednets are effective mainly because they kill mosquitos, rather than because they provide a physical barrier. (This explains the view that much of the benefits of bednets come from community, rather than individual, coverage.) DEET might not generate resistance, but I don’t see evidence to indicate that it would capture the main benefits of ITNs.